The constantly shifting sands mean there are no maintained trails into the dunes of the national park; instead visitors are free to hike anywhere. Away from the dunes, the park has only a few paths, and most of those are in the far northeast corner, starting from remote trailheads. The two main lower elevation routes are the Mosca Pass Trail to a gap in the mountain crest, and the Sand Ramp Trail along the edge of the dunes. This short trail is a spur that forks off near the beginning of the Sand Ramp Trail, just north of the crossing of Buck Creek, and climbs a little way up a lightly wooded ridge to an overlook of Medano Creek and the sand dunes. 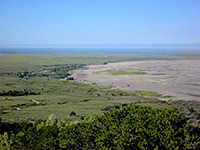 A 4WD vehicle is needed to reach the start point for the Medano Lake Trail, high up in the Sangre de Cristo mountains. The path follows a forested valley to a pretty lake at 11,518 feet, just beyond the timberline, surrounded on three sides by steep slopes of rock and scree. The summit of adjacent Mount Herard can be reached by an off-trail scramble, gaining another 1,832 feet. This short loop climbs a little way up the wooded hills on the east side of the dunes, passing the site of a late 1800s homestead, and reaching a high point that gives good views of the sands below. The start is along the lower end of the Mosca Pass Trail. The trail to 9,737 foot Mosca Pass climbs steadily but not too steeply up a wooded valley, staying close to a small creek most of the way. The path starts along the short Montville Nature Trail. The trail is best for wildflowers rather than scenery as apart from short stretches near the start, the views are quite restricted. Trees fade away at the top but even here there is no grand panorama, as gently sloping hillsides hide the wider landscape. The most remote hiking destination in the national park is Music Pass in the northeast corner; a saddle in a long narrow ridge extending north from Snowslide Mountain, bordered to the west by a deep valley holding the upper end of Sand Creek. From here, continuation trails lead to the Upper and Lower Sand Creek lakes and to the top of another summit, 13,522 foot Milwaukee Peak (additional distances 3, 3.5 and 8 miles respectively). The 3.5 mile hike to the pass can be shortened to one mile for people with 4WD vehicles. Most people just walk one mile along the Sand Ramp Trail, as far as an overlook of the dunes, a little way up in the Sangre de Cristo foothills, but the path continues ten miles further. The trail stays a little way from the edge of the sands, continuing north then later west, where it does return to the dunes, and ends at a wooded area beside another large drainage (Sand Creek). There are several primitive campsites en route. One option, for a loop hike, is to leave the path after 2 or 3 miles and walk west, across Medano Pass Road and Medano Creek, returning beside or through the dunes.